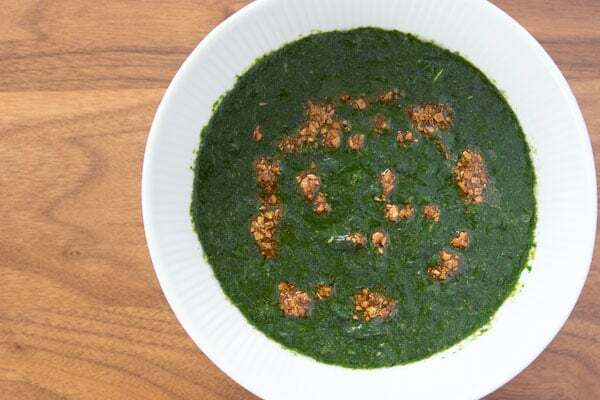 This popular Egyptian soup made with minced Jute leaves is nutritious and delicious over rice and chicken. Molokhia ( ملوخية), also known as Jute, or Jews Mallow is the name of both a plant and a dish. It has medium sized saw-toothed leaves that come to a point at the tip and have small tendrils at the base of each leaf. Nutritionally, it has three times the calcium and phospherous as Kale, and four times the amount of riboflavin. It also provides 70% of the RDA value for Vitamin C, 25% of the RDA of Vitamin A amongst a host of other minerals and vitamins. Put simply, it’s an extremely nutrient dense vegetable that’s widely eaten throughout the Middle East and Asia. So why hasn’t it enjoyed the same kind of popularity in the US? My guess is that it has to do with the mouthfeel. Like other members of the mallow family, including Okra and Marsh Mallow, the plant has a mucilaginous texture that’s intensified by bruising and lightly cooking the leaves. While it’s a cherished consistency in many cultures, I can see how it might be a turn-off if you associate the texture with the unpleasantness that comes with a cold. Molokhia the dish is made throughout much of Africa and the Middle East, but the origins of the dish are said to be in ancient Egypt, where it’s still popular to this day. In the Egyptian preparation, the Molokhia leaves are stripped from the stems, then minced using a mezzaluna. It’s cooked with ground coriander, garlic and stock and is often served with chicken (or more traditionally rabbit). In Levantine countries such as Syria and Lebanon, Molokhia is made with the whole leaves and is served with a vinegar and onion sauce along with toasted pita squares. While I’ve used Molokhia for years in Japanese cuisine, I first encountered the eponymous dish while cooking in a kitchen in the Middle East where the chefs were Egyptian, Syrian and Lebanese. I was struck by how utterly simple it was and yet so comforting. Savory, and redolent of garlic and coriander, Molokhia has a verdant flavor made rich with the viscous mucilage from the leaves. In many ways, it reminded me of a marvelous green gumbo I once had at a farmers market in New Orleans. The fresh leaves can be hard to find in the US, but I’ve seen them in Asian grocery stores. It goes by the name bai po in Thailand, nalta sag in India, saluyot in the Philippines, and moroheiya in Japan. You should also be able to find it frozen in any Middle Eastern grocery store. For vegetarians, you can make this without chicken. Just substitute some vegetable stock for the chicken stock and serve it with roasted veggies such as bell peppers, zucchini and eggplant. 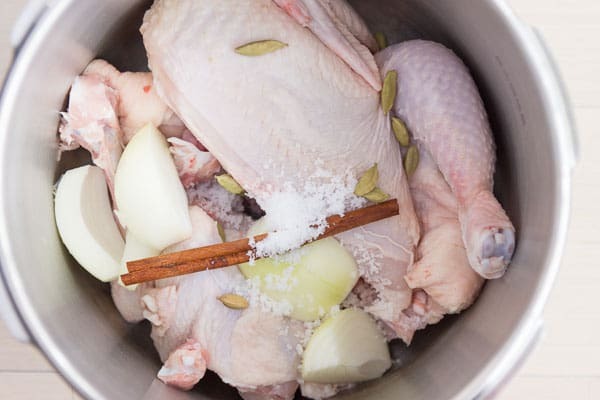 Add the chicken, onions, cardamom, cinnamon, bay leaf salt and water to a stock pot that's just large enough to hold the chicken. The chicken should be completely submerged. Cover and bring to a boil, then remove the lid and skim off any scum that accumulates on the surface. Keep skimming until there's no more foam coming up. Turn the heat down to a simmer, and cook the chicken for 20 minutes. 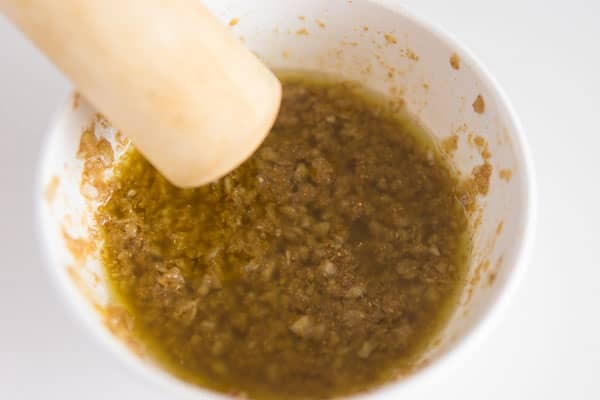 To make the Taqliya, combine the garlic, coriander and olive oil and salt and mash together into a paste. Prepare the molokhia, by removing the leaves from the stems, and then washing thoroughly to remove the grit that accumulates on the leaves. Use a mezzaluna or chef's knife to mince the leaves. You can also put the leaves in a food processor and pulse. When the chicken is done, transfer it to a bowl using tongs and cover the chicken with plastic wrap to keep it from drying out. Thoroughly wash the rice and cook it according to the direction on the package, but substitute the chicken stock for the water. 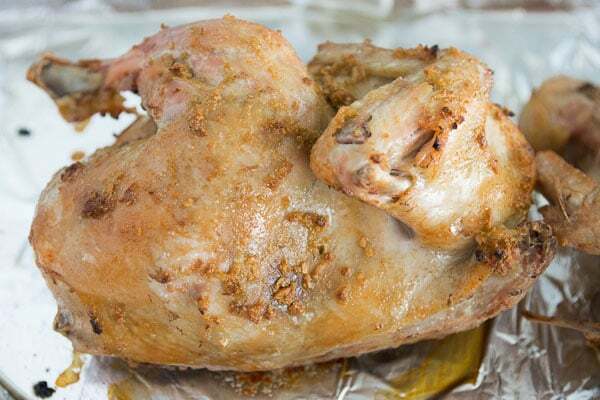 When the rice 15 minutes away from being done, preheat the oven to 230 C (450 degrees F) spread about 1/3 of the Taqliya on the chicken skin, sprinkle with salt, and then place the chicken on a roasting pan. Bake the chicken for 15 minutes, or until the skin is golden brown. Add half the remaining Taqliya to a pot. Fry the mixture until fragrant and browned. Add the 1 1/2 cups of reserved chicken stock along with the minced molokhia. Gently simmer, stirring occasionally until the molokhia is cooked (about 10-15 minutes). If you like your molokhia thinner, add more chicken stock. Season to taste with salt and pepper. Add the remaining Taqliya to a small frying pan along with 2 tablespoons of ghee. Fry until the garlic has browned. Add the lemon juice to the molokhia and stir it in. To serve, put the rice in a large platter. Section the chicken into pieces and place them on top of the rice. 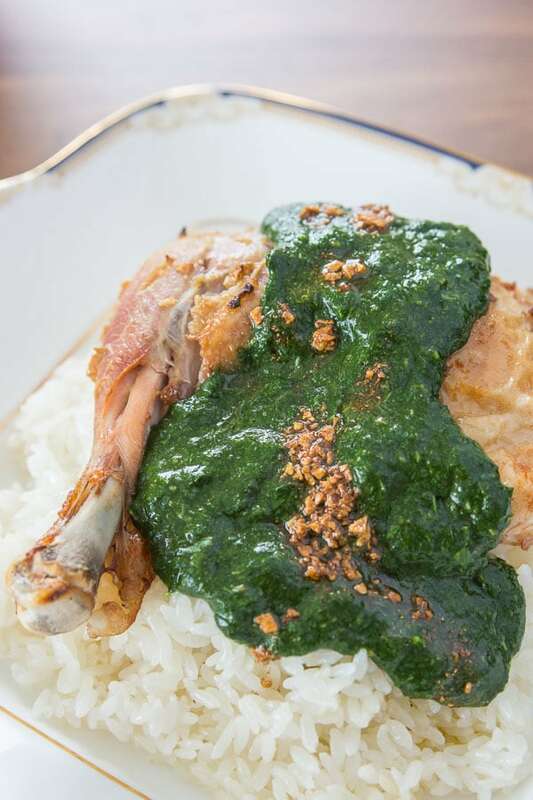 Serve the Molokhia in a separate bowl to pour on the rice and chicken. My mum’s friend used to live in Egypt and I remember having this as a child, I looked for recipes previously but never had much success! Thank you 🙂 I will have to hunt for some fresh molokhia and try and make this. I grew up eating Molokhia, sometimes made with lamb instead of chicken. We use Barahat spice and usually add lemon juice- lots of lemon! I like you’re idea on plating it. I ate this for the 1st with an Egyptian friend in the Middle East. She insisted. I was not impressed although I am considered an adventurous eater. It was as you mentioned the mouth feel—slimy and the look–gooey with a non-descript bland taste not worth the trouble. Therefore It will probably not appear on my dinner table even with all its high nutritional value. Nor will Nopal –Prickly Pear Cactus–same– same but give me okra–yum—yum! I eat this for the first time in Egypt with my husband on our honeymoon this pass November. I loved it. I’m from the states but my hubby is from Egypt and it was so Delicious. Hello there! I made this dish according to the recipe posted here. Molokhia is sold at our farmers market, and we are very curious to try new greens and vegetables. This worked out very well for us! Thank you for a great recipe. i live in CA and never saw it at farmers market.. Do they call it “Moroheiya” ? 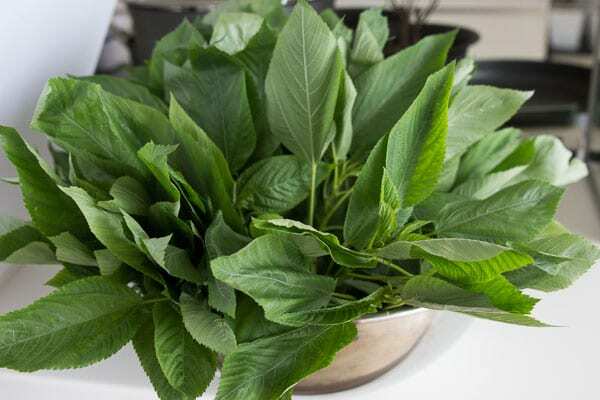 I buy it frozen from the middle eastern stores.. but I only find it minced, I prefer to cook the fresh one and not so thinly minced..
Hi Lebanese, personally I prefer the Levantine style of molokhia as well without the leaves being chopped. If you live near LA or San Jose CA, you should be able to find it fresh sold as “moroheiya” at Japanese grocery stores such as Mitsuwa. I grew up eating it one of my favorite foods! I will have to go to an Asian market to find some fresh leaves. Hi Pali, thanks for the idea, I’ve never tried it with tomato, but I’ve been adding lemon lately to cut the viscosity, it must be the acidity that does it. My mum always made it with dried leaves, she said it tasted better and much easier to break into small bits. Personally i hated as a child, but am willing to revisit. That said never met anyone apart from myself that didn’t like it. sometime much be wrong with you, or maybe the one who made it did not do a good job . I make this my self homemade and its great. matter of fact just had it yesterday. Wow… nor prickly pear.. Maybe your palette isnt tuned to delicate flavours, but Im drooling over the though of Molokhia right now! The dried version unfortunately has too many stalks. It’s hard to find and my wife would get the dried version. It was never like the freish and I’d spend hours picking out stalks. Hi Sylvia, without knowing where you live I can’t really say, but you might find it in a middle eastern, indian or asian grocery store. You can find it frozen in any Arabic or Mediterranean grocery stores. Where in Johannesburg South Africa can one find frozen molokhia ?